Now Google Maps for Android allows you to see places you have rated 4-stars and 5-stars on the map, and attach photos to reviews of Places. Yes, Google Maps Android app has been updated to version 5.10.0. As you probably already know, Google has acquired Zagat. With this update we could expect sooner than later the upcoming Zagat integration in Google Maps. 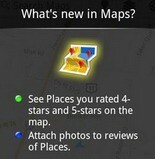 You can get the update for Google Maps Android app from the Android Market in the Travel & Local category. 0 comments on "Google Maps Android app updated, lets users see places they've rated 4 and 5 stars, attach photos to reviews"